Are you having a hard time fixing the work schedules of your employees across different locations? It’s good to know that this task is now easy to accomplish with the help of employee scheduling software. These programs are optimized to simplify the way you can schedule the shifts of your employees. ZoomShift is a subtle employee scheduling program that will make scheduling easy and fast. The program is composed of colorful tabulations and each batch is color-coded. 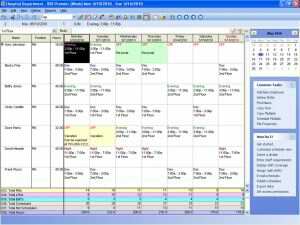 It looks a lot like Excel but its schedule marker and schedule templates are unique to ZoomShift only. 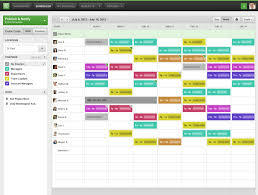 It supports synchronization with calendar services like Google Calendar and iCal. Pros: With schedule marker, supports email and text notifications, can manage schedule in multiple locations, supports open shifting. Cons: Costs $39 per month for 15 employees, $59 per month for 16-30 employees. 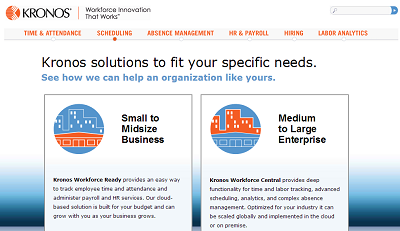 Kronos’ Workforce Scheduler is an online scheduling platform that can generate automated workforce scheduling. It also supports mobile scheduling through voice or text messaging. Kronos has been in the industry of online scheduling platform for thirty years and they are continuously developing their scheduling program over the years. Pros: With workload generator, supports mobile scheduling, can automate workforce scheduling. Cons: Complicated user interface, pricing available upon request. 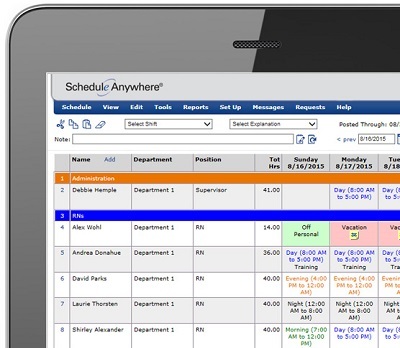 Schedule Anywhere is an online employee scheduling program where you can conveniently make schedules of your employees through the program’s spreadsheets. It supports color-coded time tables and allows employee self-service integration. The program has a free mobile app for Apple and Android so they can view their schedules anywhere and anytime they want. Pros: With free mobile app for employees, optimized time table of schedules, immediate ROI. Cons: Costs $25 per month, may have extra fees for large team of employees. Snap Schedule provides an efficient way to schedule your employees by maximizing labor costs and avoiding unnecessary overtimes. Through the software, you can have a quick overview on how you can trim down labor expenses through an efficient work schedule. The software also comes with partner mobile application for more convenient access. Pros: With free trial download, easy to understand tabulation of schedules, provides a quick overview of the schedule made to oversee lapses. Cons: Pricing available upon request. 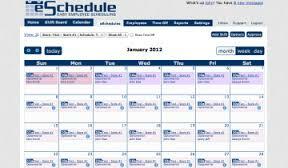 The Visual Staff Scheduler Pro software has long been trusted in generating work schedules within minutes. All you have to do is enter staffing requirements and let the software suggest work schedules for your employees. You can also pre-assign the time-offs requested by your employees as well as their desired shifts. 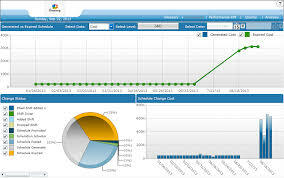 Pros: Can generate schedule reports, allows creation of custom schedule views, with modifiable scheduling tools. Cons: Costs $495 for one computer and $695 for the premier version. ShiftBoard is an online employee scheduling software that will help you manage the schedule of your staffs. It has many scheduling tools that you can modify to fit your employees’ positions and type of contracts. Its modular approach to scheduling is easy to understand so you can shorten your time in managing monthly schedules. Pros: Modular approach, with lots of scheduling tools, can generate schedule reports, can automate schedule for different types of employees. Cons: Costs $50 per month for 50 employees, with additional fees depending on the number of employees managed. EmLogis is an automated employee scheduling software that can smartly generate schedules with their SmartRules Scheduler feature. Through this unique feature, you can have a smart schedule that truly maximizes the number of employees you have. Unnecessary overtimes will be avoided and you can get the best out of your planned labor cost. Pros: SmartRules Scheduler automatically creates work schedules, can generate employee profile and schedule reports, ensures schedule compliance. ShiftPlanning has an easy to understand tabulation of schedules where you can instantly add modifications through the drop-down list box. The software is also capable of sending notifications through email whenever a new schedule has been made. Pros: Allows attachments of maps to schedules, convenient diagram of assigning shifts to different locations, simple user interface. Cons: Costs $33 per month for 2-14 employees which is pre-paid annually. For monthly payment option, extra fees may apply. 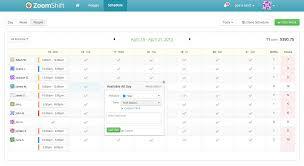 eSchedule is equipped with different scheduling tools that can create different scheduling boards for open and floating shifts. It can also generate schedule reports and can send email notifications once a new schedule has been posted. Pros: Syncs with Google Calendar, Apple iCal and Microsoft Office, can save employee profiles, fully customizable settings. Cons: Costs $15 per month for up to 30 employees managed, complicated user interface. When I Work is an employee scheduling program that is partnered with mobile apps for Apple and Android. It can help format schedules in an easy way. You can also instantly notify your staffs through the integrated text messaging service of the program whenever a new schedule has been made. If you want to make changes or updates with the schedule you made, you can access it anywhere and anytime through your smart phone or tablet. Pros: Supports planning of payroll expenses and overtime schedules, free mobile apps for Android and Apple, with color coded tabulation of schedules. Cons: Costs $29 per month for 20 employees and $39 per month for up to 30 employees. Thanks to these 10 employee scheduling software, you can now start selecting the best for your needs. Make your managerial tasks easier by maximizing the scheduling tools you can have online! If you don’t mind I would add to the list one of the most perspective softwares avialable at the market, NimbleSchedule.com! Since I am using it the scheduling is amazingly easier. A multitude of software features enables managers to create schedules and track their employees time on/off an a simple manner. Great list! Employee Scheduling is a really fun industry. You’ve certainly nailed the list of the leading products. Hopefully in your next list you can include our solution TixTime for Employee Scheduling.